This morning on GMS Johann Lamont explained that she ‘believed in socialism’ but not universal provision. During this conference season, we are being offered alternatives to the Coalition’s welfare reforms which are causing heartache for those already in dire poverty. In particular, Labour is telling us they are the defenders of the poor and arguing we can only be Better Together by trusting them to protect the vulnerable. So what do history and official statistics tell us? The data for poverty and inequality across Europe for 2010 should indicate how Labour perform when in government with full control over taxes, benefits and the economy. That year Labour were coming to the end of 13 years in power at Westminster and so surely had had long enough to promote inclusion and security. The European Community’s publication on Income and Living Standards (averaged across 2007-2010) is most interesting. Almost 55% of the unemployed in the UK were officially in poverty over that period, the fifth worst rate in the EU of 27 countries. If how we treat the poorest in society is a measure of fairness and justice then the inactive (sick and disabled of working age) were in such a poor position compared to their fellow citizens here that over a third were in poverty: the highest rate in the EU. Disabled adults were twice as likely to live in low-income households as non-disabled adults in the UK, and both were at higher rates than before Labour came to power (that’s from their own government’s DWP publication). Almost one in eight adults (the fifth highest) and one in five of children lived in jobless households, the highest levels in the EU. The levels of welfare benefits which created and sustained this inequality were lower in the UK than the average for the whole of Europe, and lower than anywhere in the north and west of the continent. As was argued strongly by Professor Adrian Sinfield: “Why some affluent Western democracies maintain substantial poverty and others are more egalitarian and accomplish low levels of poverty is mainly due to “the generosity of the welfare state”. Labour chose to keep these degrees of poverty; they had options and chose to promote bankers and financiers. Here is the problem: despite Labour’s discredited and ridiculous aneurysm story, their wider message, that the Union offers the best prospect for a caring progressive polity just doesn’t chime with peoples everyday experience, nor their recollection of the past 30 years, nor their idea of what’s coming down the tracks. According to the prospectus offered in Brighton yesterday, Labour might cause a few more houses to be built. Something might be done to put a lid on fares and bills. There might be a partial reform of zero-hours contracts. The minimum wage might begin to approach the level of a living wage. A little help might be given to small businesses. Child care, for some in England, might begin to become affordable. And the disgusting bedroom tax might, barring a few details, become a memory. What’s wrong with that? Nothing, in isolation. But if Mr Miliband is remotely serious about the democratic claims of his “one nation” he is evading the issue. Economically, socially and politically an entire society has been thrown out of balance since Blair was elected. A tiny minority prosper mightily, the rest are screwed. It is not “impossibilism” to say so. It is not impossible to enact reforms in the name of the majority. Miliband’s credibility is crucial to the No campaign. It’s essential that we must maintain and sustain a notion that there is a viable progressive opposition in England that will leap back on stage at any moment. 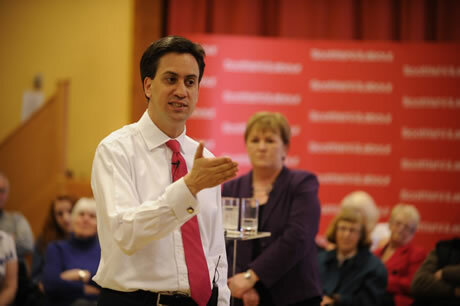 As Miliband’s credibility crumbles so does the Unions. The narrative for Cathy’s story only works if you accept two background ideas, first that Scotland would be somehow ‘separated’ from the world/England when deciding their own government and second that we would struggle to maintain the basic services and provisions we currently do. In that sense it doesn’t matter to Labour members that their story has no basis in fact, that is not it’s purpose. It’s purpose is for people to be discussing the idea that if you were ill ‘abroad!’ in England you would somehow be vulnerable. Vulnerable only in terms of what it might cost you if you travelled without insurance. Ireland gives a useful example as to how this might work – I presume you would be covered for emergency treatment under an E111 type thing, beyond that anything long-term or requires transport back to Scotland would incur costs. ie you become over excited and have a heart attack in Swindon, should you live, your initial emergency treatment would be provided after that you would need insurance. Your ending comment I think makes the wrong point about the underlying discourse of this argument – ‘idea that if you were ill ‘abroad!’ in England you would somehow be vulnerable.’ – the emphasis is wrong, the argument from Miliband is trying to suggest that you would be ‘vulnerable’ at home if you became ill, not when travelling. ie if the specialist treatment centre is based south of the boarder accessing it ‘could’ become an issue post-independence. Its not uncommon, however, for patients to be referred into health systems within a different administration, and, yes, there are already accounting arrangements in place to cover this. The Milliband proposition is altogether more sinister. He is saying: “vote for independence and we will not reciprocate in this civilised way”. Despite it being common practice across Europe. He also delivers the suggestion that Scottish patients are, in some general sense, dependent on specialists south of the border. Threatening, xenophobic, disparaging. It certainly is threatening but disparaging and xenophobic, really? Some patients probably are dependent on specialists in England or further afield – in the same way that some south of the boarder probably benefit from services in Scotland or in Europe – I don’t really see that as an issue. With a pop of circa 5 mill (and even with a pop of 60 mill) you cannot treat and provide for everything with a high level of excellence when there is such a variety of illnesses and conditions that may affect only tiny proportions of the population. There used to be a time when many people had to fund raise to get specialist cancer treatment in the US, that doesn’t really seem to happen so much any more. As I said, it is threatening and that’s the point I make about the emphasis of the argument and why the article above is not critiquing adequately the argument made by Miliband. Thanks for all your comments, I think it works both ways – instilling the idea of being ‘vulnerable’ both ‘at home’ and ‘abroad’. It’s an indiscriminate distortion. There is another issue in this preposterous piece of banal spin. What if Cathy had been Swedish or Spanish. As a “foreigner” would she have been allowed to die in the street. That appears to be the logical conclusion to be drawn from Milliband’s nonsense. I believed till recently that what was left of the labour Party was just not very motivated by political idealism any more. Faintly innocuous in political terms but relatively harmles and ineffectual. I now believe it to be led by morally bankrupt stupid people who think the rest of us are equally stupid.